Before things got a bit crazy, in that lull after Christmas and New Year's, I signed up for a Valentine-themed swap, organized by Heather of Speckled Egg. It was sweet and simple - fill a match-box with vintage-inspired goodies. I sent my parcels off in good order. And it was simple, and very fun. This morning's mail brought my first package in return from Samantha, who does not have a blog. Thank you, Samantha. 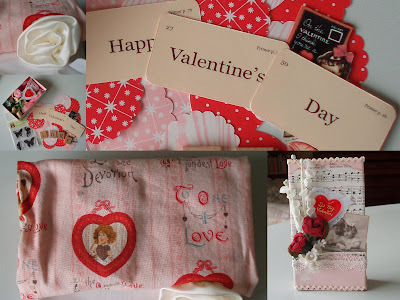 The decorated box came wrapped in fabric printed with hearts and sweet sayings. Flash cards, flowers, paper cutouts and more filled the box. All this sweetness is causing me to yearn to create pretty things instead of work on a paper about the "social organization and culture of the Germanic tribes prior to their invasion of the Roman Empire." Wouldn't YOU rather play with paper and lace and glue? Sigh. Enough of a break. Back to the books. Yes, it would make me want to leave that kind of paper behind for sweeter things. Lovely treasures you received...what kind of matchbox are we speaking of? The only kind I know are very, very small. By clicking on the photo, I answered my own question. Wow! One can get a lot of goodies into a matchbox!! Pretty! I got two so far and I loved them! It is so fun doing swaps! How cute and tiny can you get..... what fun it must have been opening your parcel. WOW...I didn't realize that much stuff could be placed into a matchbox either!! Good looking "goodies", anxious to see what you do with all of it!! For some reason, I thought you finished your classes last semester. I guess I must be behind! What a wonderful box full of goodies you received. I can't wait for Valentine's day since the kids will be here. You are right, I won the best prize of all with them being able to spend time with us. I'd much rather be playing with all those goodies! What fun this swap sound like it was for you!! Yes, pencils, paper and glue are such fun. Thanks for your sweet comment on my "charm and grace" post. How I would love to be able to sit with you for a cup of tea and conversation, also. Maybe one day we will! And if not here on this earth, then when we're really Home!